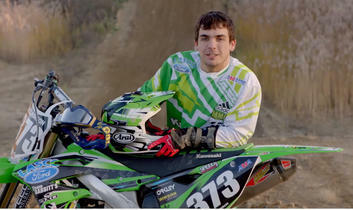 It’s safe to say that when Ron and Michele Williamson put their son on a dirt bike at the tender age of 2 that they had no idea what an amazing impact it would have on his life. Growing up in the Swartz Creek area Jacob Williamson riding trails with his dad. Starting to compete at 4 years old, it took him until the age of 10 to really figure it out, and realize that he might really have a shot at making something of himself with the sport. If you ask him about it, he will tell you “it is truly what I was meant to do in life”. When you talk to Jacob, the first thing that hits you is; Wow, this is really a down to earth, hardworking kid. A senior at Swartz Creek High School, and driver for Lasco Ford, Jacob tries to ride almost every single day. He has literally dedicated his life to the sport. When I asked him what makes him a strong rider he simply said “I’m really hard on myself to do better at every race and I don’t give up.”The tireless hard work and dedication to the sport has paid off and at the age of 10 he was riding amateur Arenacross and that led him to race Pro Arenacross at the age of 16. . He continued to excel at arenacross and picked up local support from MMCR and Lasco Ford to push his career in the sport as far as he could reaching 3rd overall in the Amsoil Arenacross Series Lites East Standings.That in itself would be impressive, but he took it a few giant leaps forward from there, and in just 4 races completed Ricky Carmichael’s road to Supercross (a point system that a racer must complete in Arenacross to qualify for Supercross) and kept pushing forward. Competing in his first Supercross in Toronto in last summer, on the first Supercross track he had ever ridden (Whaaattt!??!? ), managed to come in 14th and obtain his Canadian Pro license. Most riders would be basking I the glory of the success, but Jacob” “I knew I could have rode better, so I was happy and disappointed because I was so close to the top ten and I wanted to get in the top ten.” That is the mindset of a true champion.Next stop? 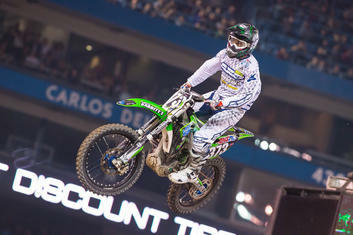 The U.S for the Monster Energy AMA Supercross 250SX East Coast Lites Series in Detroit, Michigan this past March. Williamson has his second shot on a Supercross track, you heard that right only his second time on riding on a Supercross track, ever. What does he do? He places Ninth. Unbelievable. The top 10 riders make the main event and are pitted against the most talented Supercross riders in the nation. Finishing 16th overall in the main event, it’s pretty safe to say that he is one to watch.How did he celebrate? “Well, I live like forty-five minutes from there [Detroit] so we drove home and I got to sleep in my own bed. I woke up and had a pretty healthy breakfast and just relaxed on Sunday and got back to the gym on Monday.”What is it like to ride Motorcross? Anybody who’s ever taken a lap around a motocross track will tell you that it’s extremely physically demanding. In fact, one famous study claimed that the only sport that required more physical stamina than professional motocross is World Cup soccer. To get an idea of how difficult it really is, try running as fast as you can for thirty minutes. It’s something like that. When asked what Jacob’s greatest goal is with the sport is, it’s the ultimate success – the factory ride. And by the looks of it, that is exactly where he is headed. Previous articleTouch-A-Truck at Bush Park!